Social networks are engaged in a constant competition for a bit of your attention and time (or a surprisingly large chunk of time, as it turns out to be the case with Facebook) with new app developments and upgrades. Even for social media managers, it can be overwhelming to keep up with the daily news—that’s why we launched This Week in Social, an overview of the biggest or most unusual social media news. And this week, our Sunday news round-up is a bit of a DIY-social-web edition. We explore all the new possibilities appearing thanks to social media, such as making emoticons out of selfies and writing novels on Twitter. What takes up more of your day, your morning commute or browsing Facebook? During this week’s Q2 earnings report, Facebook CEO Mark Zuckerberg said that an average Facebook user in the US spends around 40 minutes a day on Facebook. As one article aptly points out, that’s twice as long as the daily exercise routine recommended for Americans (Canadians have a similar recommendation, about 150 minutes a week—130 minutes less than we spend on Facebook, if US stats are any indication). A possible solution? Browse Facebook while running on that treadmill! Maybe that can be the time to read the posts you bookmarked using Facebook’s new Save feature. Many Instagram users noticed a banner at the top of their home page advertising a free download of a “one tap photo messaging” app named Bolt. However, the download button linked to a dead URL, and there doesn’t seem to be an app matching this description in either Google Play or iTunes Store. Two theories dominating the online discussion surrounding the leak include a theory about Instagram (or Facebook, as the two are in the same family) introducing a Snapchat competitor, or a test of ‘app install’ advertisements in Instagram. LinkedIn takes its professional social network niche very seriously, with every acquisition falling naturally into place with the purpose of networking and career advancement. Such is the case with LinkedIn’s newest acquisition, Bizo—a marketing platform helping business-to-business advertisers find their target audience. A LinkedIn blog post with the acquisition announcement pointed out the growth of B2B advertising on LinkedIn, and Bizo’s technology is expected to improve the existing framework. 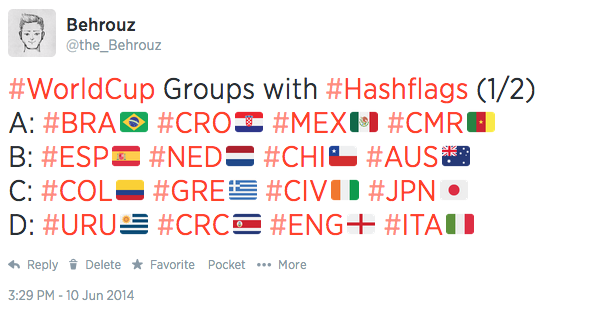 Bright colors of hashflags representing different countries won’t be decorating Twitter feeds any longer, at least not until the next World Cup. The feature was taken off, along with the rest of the Twitter’s special features to gear up for the FIFA competition (and, arguably, overall global interest in soccer on social media). Not all hashflags have been removed, however. Those observing Ramadan can still see the colorful symbols—the blue crescent moon and Arabic calligraphy, to represent different regions—on their Twitter feeds. After months of beta-testing, Reddit Live is now available for all fans of the front page of the Internet. The Live feature is designed for real-time update threads where anyone can post, and others will see the post without having to refresh the page. Reddit Live updates will exist outside of subreddits, and would have to be submitted like any other posts. Have you ever swiped through pages and pages of Emojis, thinking, “If only I could use a picture of my actual face, I know exactly the expression I need”? A new app Imoji can solve this problem. The app creates a sticker out of any image of your choosing, and then use them with iMessage. If you think other Imoji users could also benefit from using your face to communicate with more clarity, you can set the sticker privacy setting to public. Creators of the app promised more social features to be added in the future, which will allow users to earn points by creating popular personal (and personable) emoticons. We recently posted a list of comedy writers who managed to land big Hollywood breaks through their hilarious Tweets. And there are many more examples of creative people who circumvented the media gatekeepers by building an audience on social media. We fell in love and drove backroads and stayed in motels. And then she suggested marriage and I called her old fashioned. That made her sad. Arjun Basu was one of the first when he started writing his single-Tweet short stories, which he calls Twisters, back in 2009. His well-received debut novel, Waiting for the Man, was published this year, but it was on Twitter that Basu built his brand as a fiction writer. Every aspiring novelist has been given the same advice at some point, and it may still be true: you’ve just got to sit down and write the first sentence. Just make sure it’s shorter than 140 characters.